The Last Ship: F*ck The Bishop! After last year’s most eagerly anticipated announcement of who would take over from Nick Hytner as artistic director, recipe today has been the day for the year’s most eagerly anticipated announcement of Rufus Norris’s first season at the helm. And my initial impressions are very good. His opening season definitely signals changes in the air, but also a welcome sense of continuity, too. Norris has appointed a new group of associates that brings Tom Morris back into the National fold (while he continues to run Bristol Old Vic) and also includes Dominic Cooke (returning to the theatre for the first time since he left the Royal Court), as well as includes Marianne Elliott, Ben Power, Lyndsey Turner and Paule Constable. The directorial roll call of those who also be directing at the National this year also includes Nadia Fall, Polly Findlay, Simon Godwin, Jeremy Herrin, Roger Michell, Ian Rickson, and Indhu Rubasinghma, all of whom have worked at the National before, and Sally Cookson. It’s also good to have Patrick Marber back at the National, with his first original play in years as well as a separate version of an existing play that he will also direct. Norris himself reunites with composer Damon Albarn, with whom he collaborated on Doctor Dee that was seen at Manchester International Festival and at the London Coliseum (under the auspices of English National Opera), for a new musical wonder.land that will premiere at this year’s Manchester event and then come to the National. I’m not quite sure we need another Our Country’s Good, so soon after its original director Max Stafford-Clark last brought it back to London’s St James Theatre in 2013. The announcement was also notably short on big casting announcements: only Chiwetel Ejiofor, who will star in Norris’s own production of Everyman, and Anne-Marie Duff in a Manchester co-production of DH Lawrence’s trilogy of mining dramas condensed into one play, now called Husbands and Sons, seem to have stars attached to them already. But no doubt more will be revealed in time. Watch this space. When Thriller Live arrived at the Lyric on Shaftesbury Avenue exactly six years ago today, there I thought it felt very much like a filler that would be there for a few months but then move on. Instead, order of course, it was Michael Jackson who moved on himself to the great pop arena in the sky, and the show became a sort of living memorial to him. In the days following his death, the theatre became a shrine with fans coming there to post tributes. (There’s now a permanent one in the foyer). The show recently became the 20th longest running musical in the history of the West End, and is about to move more positions up: this coming Sunday (January 25), it overtakes Grease; and then in April, it will overtake the original 1960 production of Oliver! to take 18th position. I don’t think it pays to be snobbish about shows like this — the West End should have room for all sorts of shows (yes, even Let It Be — about which I once wrote, “Let it Be? Let it Not”; but I draw the line at Rock of Ages, which I think is the anti-Christ of musicals). But I’m only saddened by the fact that it has taken one of Shaftesbury Avenue’s loveliest playhouses out of circulation for so long. If only they could move it to the Trafalgar Studios, I’d never have to go there again…. Sting’s The Last Ship closed on Broadway last night, store after a disappointing run of just over 100 performances since it opened on October 26. At the final performance, he gave a moving curtain speech in which he said:? ?’Before we take our final bow, I feel it’s incumbent on me to say something. I’m not sure I’ll get through it without breaking down. I need to be a better actor, but I will try. There’s no point in pretending [this] is not incredibly emotional. I think I can speak for all of us onstage, not least because there are so many parallels between the closing of a play and the closing of a shipyard. Some of the lines that we were saying as actors are so appropriate to our lives, just as they’re appropriate to the lives of the shipyard workers fighting for their livelihood. Patrick Healy, one of the best as well as most influential of all theatre reporters in the New York thanks to his perch at the New York Times, is returning to the political beat: he previously covered the presidential race in 2008 there before swapping to Broadway. It’s just been announced he’s going to be a national political correspondent for the next presidential campaign again. That’ll obviously be easier than covering the monstrous political egos of those on Broadway! Talking of a monstrous ego, producer Harvey Weinstein — who fired the entire creative team for the musical Finding Neverland after its Leicester try-out in 2012, including its original authors and director — has now seen the press agent for its Broadway transfer suddenly resign the account. According to Pat Healy’s account in the New York Times published today, strong words were exchanged in a meeting earlier in the week when Weinstein, who is used to magazines falling over themselves to cover his films, asked why few were covering his show. Well, this has proved to be one way of getting press coverage for the show! You can’t, as they say, buy this sort of publicity….. It was announced today that the current Broadway production of The Elephant Man, starring the Oscar nominee Bradley Cooper, is headed to the West End’s Theatre Royal Haymarket from May 19, for a run through August 8, along with the complete Broadway company. But it’s coming with appropriately elephantine prices to match: all seats in rows C-L of the stalls are £108, with the remainder of the stalls at £65. The central block of the upper circle is a not inconsiderable £45 — with restricted view seats on the sides at £35 and £25. The ever-onward upward march of ticket pricing in the West End clearly no longer has a ceiling. Will audiences revolt? It’ll only change if they vote with their feet (and seats) and don’t book to see it, of course. Watch the prices then tumble as those £108 rows get marked back down to £65. 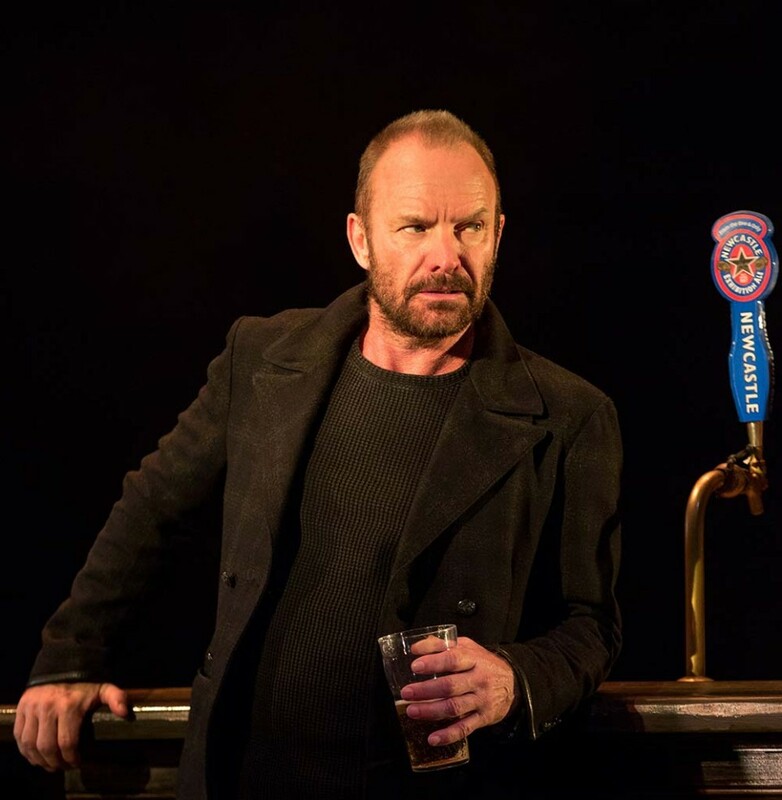 Sting’s The Last Ship closed on Broadway last night, check after a disappointing run of just over 100 performances since it opened on October 26. At the final performance, illness he gave a moving curtain speech in which he said:? ?’Before we take our final bow, look I feel it’s incumbent on me to say something. I’m not sure I’ll get through it without breaking down. I need to be a better actor, but I will try. There’s no point in pretending [this] is not incredibly emotional. I think I can speak for all of us onstage, not least because there are so many parallels between the closing of a play and the closing of a shipyard. Some of the lines that we were saying as actors are so appropriate to our lives, just as they’re appropriate to the lives of the shipyard workers fighting for their livelihood. ”One of the ideals that an actor will strive for is for the needs and emotional landscape of the character to coincide with the needs and emotional landscape of the actor playing that character. We have that in spades up here. (Audience cheers.) That somewhat might explain some of the intensity onstage at every performance. But this show is far from over — Sting will himself perform songs from its score in concerts at the Sage Gateshead on April 24 and 25. I plan to be there! Today the Independent on Sunday has looked back on its first quarter of a century of publication. Strangely, however, they don’t mention the almost total annihilation of their arts desk. A Sunday paper without an arts section is simply not doing its job. Shame on them! But they also started a trend, alas: the Sunday Telegraph, too, no longer covers the arts.